In its original incarnation Nautitech was a captive catamaran brand belonging to Dufour Yachts. For over a decade now, Nautitech has operated independently and has steadily shifted its production focus away from the bareboat charter market and toward private owners and active family cruisers. In its original incarnation Nautitech was a captive catamaran brand belonging to Dufour Yachts. For over a decade now, Nautitech has operated independently and has steadily shifted its production focus away from the bareboat charter market and toward private owners and active family cruisers. Its latest offering in the North American market, the 441 cruising catamaran, which debuted in Miami in February 2012, is attractively finished and exhibited excellent manners during our test sail. The hulls are solid fiberglass laminate below the waterline; both the hull topsides and deck are cored with a lightweight PVC foam. Both parts are infusion-molded to ensure the most efficient resin-to-fabric ratio. Internal structural bulkheads are all high-quality marine-grade plywood. The hull design, originally created in 1995, features low-aspect fixed keels and a relatively low bridgedeck that helps maximize interior accommodation space. The deck also reaches far forward of the mast on the central crossbeam, which again helps increase interior volume. 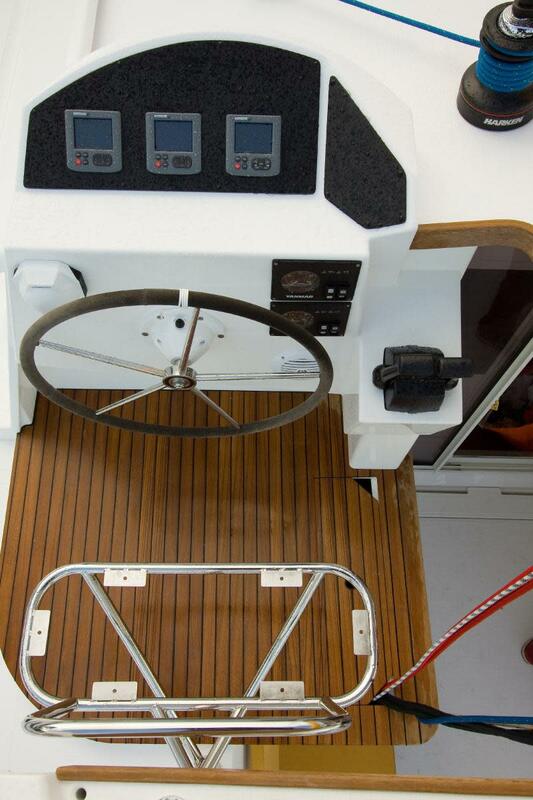 The distinguishing feature of this version of the boat is the single bulkhead helm station, situated to port behind the coachroof, as opposed to the twin helms found on its sister model (the Nautitech 442), which are outboard and aft on the hulls. In all other respects the two models are identical. Our test boat was equipped with a small bimini enclosure around the helm station, which afforded excellent horizontal visibility, but otherwise made it impossible to view the sails without stepping well away from the wheel. My other quibble with the helm is that it is a bit of a reach to the starboard genoa sheet. If you’re on the short side, you’ll want to make sure you are comfortable with its placement. I particularly liked the double-ended mainsheet, which is led to both the helm and the aft cockpit control station, where the main traveler lines and screecher/spinnaker sheets are also situated. All control lines are thoughtfully arranged, making it easy for one crew and an autopilot, or two crew without a pilot, to manage the boat. Another impressive topsides feature is the long integral wraparound rain gutter that encircles the outer edge of the coachroof. This captures all rainwater running off the coachroof and funnels it to a Y-valve below, where you can elect to route it either straight overboard or into your water tanks. Moving forward, I found that the wide, flat side decks offered very secure footing in a seaway. The anchor locker, in the main crossbeam forward of the mast, is unusually large and deep for a boat of this type. Our test boat had the owner’s layout, with a full-size owner’s stateroom occupying the entire starboard hull. This is a fabulous space, with a private desk and an ensuite head that includes a very large segregated shower stall. Forward of the shower is a large utility space housing a washer/dryer. The port hull has two guest staterooms, each with its own ensuite heads and athwartships double berths. Three other layouts, including a “charter” version with four staterooms, are also available, and layouts can be customized if desired. The interior finish quality throughout is well above average for a mass-production catamaran. Moving up into the saloon, I was impressed by the galley, which is aft to port, with easy access through a sliding bulkhead window to the cockpit dinette table. Though compact, the galley has an amazing amount of stowage space, with no fewer than 15 different useful compartments within immediate reach. The nav desk, situated opposite, has plenty of room to lay out charts and papers. I sailed the Nautitech in moderate conditions in open water off Miami Beach. Our test boat carried a large square-headed mainsail (an option), plus a 120 percent overlapping genoa furled on its headstay. For a low-slung cat with fixed keels, performance to windward was better than I anticipated, though the boat was a little sensitive to sea state. On port tack we made very good speed, hitting 7 knots sailing at an apparent wind angle of 45 degrees in a 10-13 knot apparent wind. On starboard tack, however, where we hit the chop at a bad angle, the hulls had a tendency to hobbyhorse, and we had to crack off a little to keep the boat moving at 6 knots. Tacking the boat singlehanded was easy, and it turned smartly through the eye of the wind. Cracking off a bit more, we unrolled a large, nylon screecher set on a small sprit and the boat leapt forward with a will. At an angle of 65 degrees we had her going as fast as 9 knots in 12 knots apparent wind. At 90 degrees she was still making better than 8. Turning downwind onto a broad reach at a 140 degree angle, we found we could still hit 6 knots in just 8 knots of apparent wind. Given that the boat has hydraulic steering, helm response was surprisingly positive and crisp. Our boat carried twin 39hp Yanmar diesel engines with saildrives, though Volvo engines can also be specified. The engine spaces are entirely segregated from the interior living spaces, which helps reduce noise and vibration. Primary access to the engines is through large hatches in the transom steps; secondary access is through overhead deck hatches. While motoring out through the Port of Miami and Government Cut, stemming a 15-knot headwind and running through a light chop, we maintained a cruising speed of 7.7 knots at 2,100 rpm. At maximum throttle, turning 2,900 rpm, this increased to 8.5 knots. As is to be expected with any twin-engine catamaran, the Nautitech was very maneuverable under power. If you&apos;re looking for a nicely built mass-production cruising catamaran, you would be hard pressed to find a boat more attractive than this. Both finish quality and sailing performance are above average for a boat of this type. The accommodations promise all the comfort one expects aboard a cat and can be customized to a large extent if desired.